From the host of “Beautiful Stories from Anonymous People” podcast and creator of The Chris Gethard Show, a self-help narrative for anyone who ever felt like they didn't fit in or couldn't catch a break. Your parents roll their eyes. Your teachers barely care. Your boss hates all your ideas. Do even your own kids make you feel like you’re silly for wanting to pursue your dreams? Sometimes life convinces you that you’re born to strike out, bound to lose. Well, comedian Chris Gethard is here to tell you that they’re probably right—odds are that failure is imminent. And that’s great. In fact, striking out hard and often might just be the key to a healthier, happier, more successful life that ends with you living free of regret. Failure is an art form, and the only way to discover who you are, what’s most important to you, and how to live and work on your own terms is to learn how to lose well. Setting flame to vision boards and tossing out the “seven simple steps” to achieving anything, Gethard—host of the wildly popular podcast Beautiful Stories from Anonymous People podcast and creator of The Chris Gethard Show—illustrates his personal and professional manifesto with hilarious and ultimately empowering tales about his own missteps, misadventures, and public failures, from the cancellation of his Comedy Central sitcom after ten episodes to rediscovering his comedic voice and life’s purpose on a public access channel. With his trademark wit and inspiring storytelling, Gethard teaches us how to power through our own hero’s journey, whether we’re a fifteen-year-old starting a punk band or a fifty-year-old mother of three launching an Etsy page. In the process, he shows us how to fail with grace, laugh on the way down, and as we dust ourselves off, how to turn our inevitable failures into endless opportunities. 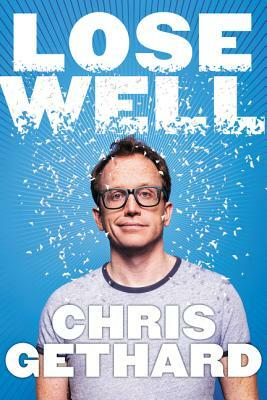 CHRIS GETHARD is a comedian and creator of The Chris Gethard Show and host of the popular weekly podcast Beautiful Stories from Anonymous People. His Judd Apatow-produced one-man show, Career Suicide, premiered on HBO and was nominated for the Lucille Lortel award for its off-Broadway run. He lives in Queens, New York.